There's no question that pink is a favorite of mine and I'm not picky for where it is. Whether it's fashion or interior design above, this dusty pink is a version that I am particularly fond of. While I never got the chance to visit, in perusing Pinterest for this week's Home Improvement post, and I'll admit, a little London withdrawal, I came across The Gallery Restaurant inside of Sketch--London. The pink is used perfectly by being paired with sort of rose gold chair bases and table top accents and a floor that is an unexpected herringbone pattern in a series of browns, and the fact that the chairs and booth style seating is plush velvet as opposed to a different fabric creates an incredibly luxe and pleasing look to the eye. 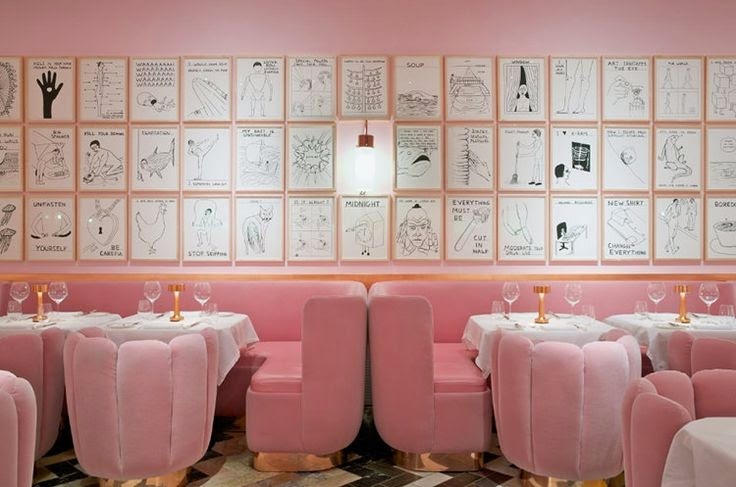 Not to mention, the almost cartoon-like drawings perfectly aligned on the wall match the playful setting and definitely make me long for the time I get to jump back to London and visit Sketch.